Ever wondered if a running horse lifts all four of its feet off the ground at the same time? Leland Stanford, an industrialist and horseman of the late 19th Century did, and he hired photographer Eadweard Muybridge to find out. Muybridge’s series of 24 photographs of Stanford’s horse, Sallie Gardner, came to be known as Sallie Gardner at a Gallop and is regarded to be an early example of silent film. The Muybridge photos were viewed at increased speed on a zoopraxiscope, a device he invented in 1879. A precursor to modern movie projectors, it projected a series of independent photographs as a moving image through the use of multiple cameras shooting the subject at different points in time. In this way it was disclosed that yes, indeed, there were moments when all four of a galloping horse’s feet hover in mid air. Today’s moving images are displayed at between 24 and 300 fps, depending on the application. 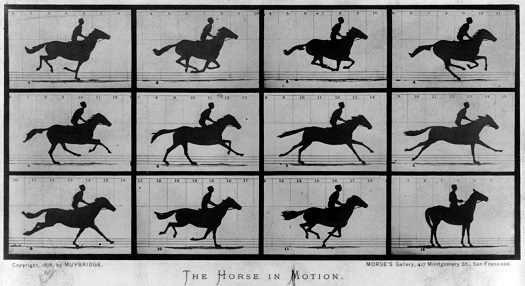 Muybridge’s experiment proved that not only are moving images more engaging than static ones, they are also more explicit, able to convey information still images are not. Take for example this series of stills of a centrifugal clutch assembly. Are you able to tell by looking at these two-dimensional images how a clutch works? 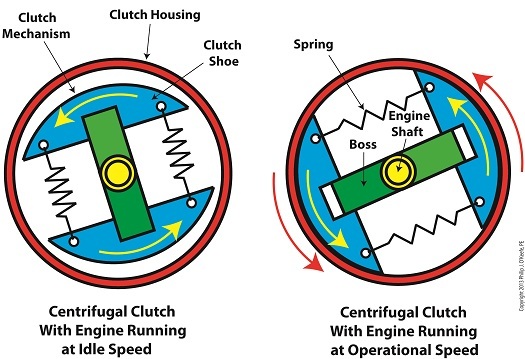 How as the engine speeds up the spinning shoes move out and make contact with the clutch housing, this pressure causing the entire assembly to spin? Unless you’re familiar with clutches, probably not. In today’s fast paced, internet-laden society, people’s attention spans are shorter than ever, and their demands to be visually engaged are high. It’s been proven that holding a modern day viewer’s attention for more than three seconds is a difficult task. This truth is evident in the courtroom as well, where trial attorneys are obliged to increase the production value of evidence presented in order to win over juries, and animation is becoming their tool of choice. What held true more than 100 years ago still holds true today: Nothing tells a story like a moving image. Next time we’ll switch gears, quite literally, to understand how a series of gears work together to power machinery. Note: If you are viewing this blog article in an email and the animation video does not appear, then click on this link to view the article with your web browser. This entry was posted on Monday, December 16th, 2013 at 8:35 am	and is filed under Courtroom Visual Aids, Engineering and Science, Expert Witness, Forensic Engineering, Innovation and Intellectual Property, Personal Injury, Product Liability. You can follow any responses to this entry through the RSS 2.0 feed. Both comments and pings are currently closed.